VENOM - SKELETONS IN THE CLOSET REMASTERED (CD) | Online Shop | Wizard LTD. 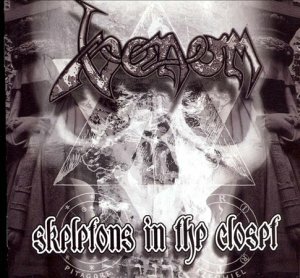 Album: "SKELETONS IN THE CLOSET REMASTERED (CD)"
A collection of demos, remixes, rarities, and entertaining trivia such as radio and TV promos, Skeletons in the Closet was released as reassessment of Venom's output began to create more interest in their back catalog. There are a few pre-Welcome to Hell songs and an epic, 20-plus-minute re-edited version of "At War With Satan." Unfortunately, the liner notes don't tell you when most songs were recorded, and the sound quality makes them sound rather distant. For die-hard fans only.